Two more of my pictures from London in 1978. I took this picture on Quaker St, with the woman about to step onto Sheba St, beyond which you can see the openings of Wilkes St and Grey Eagle St. Beyond that is a long building with 7 bays, which, unlike the rest of this is still standing. 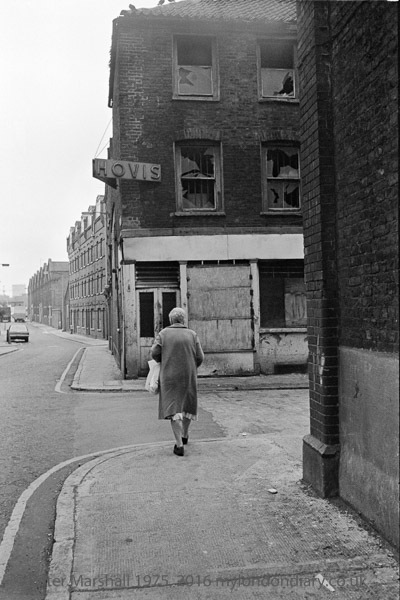 The bakers on the corner with its HOVIS sign was clearly closed and derelict and this whole area due for demolition. Quaker St (originally called Westbury St) is crossed by Wheeler Street, and one of the earliest Quaker Meeting Houses was here in the 17th century. The building which replaced it, Bedford House, is now Grade II listed. The only building in the picture still partly standing is that distant long building, Silwex House at 1-9 Quaker Street. It was built in 1888 as stables for the Great Eastern Railway and has a similar long brick appearance with 7 gables at the rear facing the railway line out of Liverpool St, where the Braithwaite viaduct, build 1839-42 is a listed building. Silwex house later became a part of the nearby Truman Brewery. Planning permission was granted to convert it into a 250 room hotel, which included a 3 storey roof extension, with the original front and back walls being retained. Taken somewhere near Brick Lane, this is a short stretch of road ending at the railway line into Liverpool St. It no longer exists but I am fairly sure that this was the section of Grey Eagle St to the north of Quaker St, where there is now a gate leading to Eagle Works. The buildings on both sides of the street have now gone. 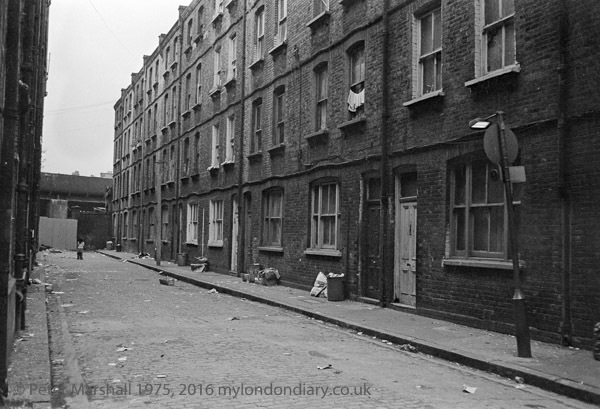 It was a pity that my black and white pictures did not include the two buildings on the corners of Quaker St and Grey Eagle St, the Grey Eagle Pub and Leons, though I think I photographed one or both in colour. But in 1978 I was still working on colour transparency and never managed to develop a reliable filing system. As well as Grey Eagle St there is also a Black Eagle St (now Dray Walk) not far away. At the end of the 16th century the area belonged to a goldsmith, Richard Hanbury, who leased part to brickmaker Edward Hemmynge, perhaps the source of Brick Lane, though there were other later brickworks in the area. Quaker St was laid out around 1656 by William Browne who had leased three acres of pasture. Hanbury’s daughter married Sir Richard Wheler (hence Wheler St) whose family retained much of the area, leasing parts out. Both Grey Eagle St and Black Eagle St were developed by one of the lessees, John Stott, a mariner from Stepney around 1661-70, and in 1666 the Black Eagle Brewery was built, possibly by London entrepreneur William Bucknall on land leased from Stott. Some sources say the Brewery name came from the strret name, but its origin is unclear. Around 1679 the brewery with its eagle trademark was acquired by Joseph Truman who had learnt the trade there (though the family records say a family member, William Truman, a brewer, attacked the Lord Mayor of London during Wat Tylers 1381 revolt) and slowly began to grow into a huge concern. Under one of his younger sons, Benjamin Truman, it became the third biggest brewery in London. In 1789 the young Quaker businessman Sampson Hanbury purchased a share in the brewery and gradually bought more, taking over the running of what with the company becoming Truman and Hanbury. Some years after Hanbury’s nephew Thomas Fowell Buxton became a partner the company became Truman, Hanbury, Buxton and Company. Buxton was a partner with William Wilberforce in the Anti-Slavery Society founded in 1823. Another brewer, Thomas Pryor joined the company in 1816, and the business was run by the three brewing families, Hanbury, Buxton and Pryor until the 1950s, becoming the largest brewery in London, outproducing Barclay Perkins, around 1850. The company was the subject of a bitter takeover battle between Watney’s and Grand Met in 1971. Grand Met won and the following year rubbed salt into the wound by taking over Watney’s. In 1989 Grand Met, who had failed to keep up with the changes in beer consumption towards real ales, realised that the London property boom made the site more valuable than a not too profitable brewery and closed it. But the property bubble burst, and in 1995 the 10 acre site was sold to the Zeloof partnership, who reopened Black Eagle St as Dray Walk and The Old Truman Brewery as a venue for events of various kinds. These pictures are on my London Photographs site, and the post is based on one made on Facebook when I posted links to these two pictures. You can view the 1978 index page for almost a hundred selected pictures of London taken that year and click on any of the thumbnails to get a larger image. This entry was posted on Saturday, April 14th, 2018 at 09:04 am and is filed under My Own Work. You can follow any responses to this entry through the RSS 2.0 feed. You can leave a response, or trackback from your own site. Photo 17h32 shows Great Eastern Buildings on the left. The next street over to the left is Brick Lane. The extension street to Grey Eagle St had two up-two downs (same as Grey Eagle St) and were derelict. In the 50s they were part of our play area. Thanks for that information. Corrections are always welcome – do please comment if you see any more. It includes a picture which shows the bakery on the corner of Sheba St and Quaker St.